Prevention of bubble formation is a central goal in standard decompression procedures. According to research published in the FASEB Journal, nitric oxide reduces bubble formation following decompression after dives of different duration and to different depths. In their experiments, the researchers from the University of Split and the Norwegian University of Science and Technology gave 16 experienced divers 0.4 mg of Nitroglycerine by oral spray 30 minutes before a dive. They found this significantly reduced bubble formation. Nitroglycerine, best known as an explosive, is converted to nitric oxide in the body. One of the effects of Nitric oxide is to widen the blood vessels. The divers were split into two groups. One group dived to 30 m in seawater for 30 minutes and exercised during the dive. The other group performed simulated dives to 18 m for 80 minutes in a hyperbaric chamber and remained sedentary. Each group performed two dives, the first acting as a control with no nitroglycerine administered. The open-water dive resulted in significantly more bubbles than the dry dive, but both sets of divers benefitted from the nitric oxide donor. Journal Reference: The FASEB Journal. 2006;20:A1249. North Sulawesi, including areas of outstanding natural beauty above and below sea level such as Bunaken National Park, Lembeh Strait and Bangka Island, has been spared an environmental tragedy. The Indonesian Ministry of Environment recently announced that a gold mine operation, which was threatening to dump millions of tons of waste into the sea in North Sulawesi, will not be allowed to do so. British-registered “Archipelago Holdings” gold mine (operating locally as “MSM”), threatened to dump up to 1,500,000 tons of ground up mining waste into the sea, between the award-winning Bunaken National Park and the famous Lembeh Strait. Marine biologists acknowledge that North Sulawesi is the centre of marine bio-diversity on the planet. It is now a popular destination for discerning dive tourists, earmarked to become a World Heritage Site. The North Sulawesi Watersports Association (NSWA), which represents many of the area’s dive resorts, helped achieve this important victory in the protection of a unique marine habitat. The NSWA launched a local media campaign to raise awareness of the threat, even presenting the case to representatives of the Indonesian Parliament. To support the continuing campaign or read more on this story, visit www.divenorthsulawesi.com. Alternatively contact Richard Parks at RP Marketing in the UK; email rpmarketg@aol.com. Start a discussion about this news. Unlike scorpion fish in other parts of the world, the spines of this inhabitant of the temperate waters are not venomous. Finland and the Northern Mediterranean. The latest issue of SCUBA News (ISSN 1476-8011) is now available on-line. In this issue: the Red Sea, best selling SCUBA books, find a cheap flight, see flight arrival and departure times, money-off vouchers, book review, and all the diving news from around the world. From November 1st a new act protects designated wrecks and sites from divers in United Kingdom waters and, in some cases, from UK divers in foreign waters. There are two levels of protection offered by this Act: Protected Places (wrecked vessels or aircraft) and Controlled Sites. Protected Places include the remains of any aircraft which crashed while in military service or any vessel designated (by name) which sank in military service after 4th August 1914. Diving is allowed at "Protected Places" but it is an offence to tamper with, damage, remove or unearth any remains or enter any hatch or other opening. This means that you can look but not touch. There are currently 36 designated vessels, sunk between 1916 and 1982. For the full list see http://www.opsi.gov.uk/si/si2006/20062616.htm. Controlled Sites are specifically designated areas which encompass the remains of aircrafts or ships sunk or stranded in military service within the last two hundred years. Diving is prohibited these sites without a specific licence. For the list of controlled sites see http://www.opsi.gov.uk/si/si2006/20062616.htm. It is probably a common conception that marine debris consists of just a few pieces of rubbish scattered along the strand line of beaches and is of no harm to anyone. Unfortunately, according to a new report from Greenpeace, this is not the case. Marine debris has become a pervasive pollution problem affecting all of the world’s oceans. It is known to be the cause of injuries and deaths of numerous marine animals and birds, either because they become entangled in it or they mistake it for prey and eat it. At least 267 different species are known to have suffered from entanglement or ingestion of marine debris including seabirds, turtles, seals, sea lions, whales and fish. The scale of contamination of the marine environment by plastic debris is vast. It is found floating in all the world's oceans, ever everywhere from polar regions to the equator. Local authorities, non-gover government organisations and volunteers have all contributed towards coastal clean-up operations throughout the world. The cost of clean-ups can be high. For example, in 1998, 64 local communities in the North Sea region spent six million US dollars on beach clean up, according to the United Nations Environment Programme. The Ocean Conservancy began a beach clean-up program in Texas in 1986 which has since grown into the International Coastal Cleanup (ICC). All 55 US States are now involved with the program together with 127 countries. All consolidate in a local effort for one day each year to carry out a beach clean-up day in their area. This is undertaken by numerous volunteers. The ICC also gathers information on the types of debris collected for its global database. In 2002, almost 58% of the marine debris collected appeared to be sourced from shore-line and recreational activities, such as beach-picknicking and general littering. conjunction with UNEP. It engages more than 40 million people from 120 different countries in clean up operations, and has a special initiative on marine debris. In the UK, a non-gover government organisation called the Marine Conservation Society has set up programmes to clean-up beaches as well as to raise awareness of the problems of marine debris. The National Oceanic and Atmospheric Administration (NOAA) of the US government have been pioneering a method to locate marine debris at sea. Ocean convergence zones, where debris is likely to accumulate, are identified by satellite. Aircraft with special sensors are then deployed to the convergence zones to pinpoint the location of debris. This has been per perfor formed experimentally and the idea is to then send ships to areas with high quantities of debris so it could be cleared up. We live in a world in which our resources are not always given the precious status they deserve. In industrialised society, this has contributed to the creation of a “disposable” society in which enormous quantities of waste, including much that is “avoidable waste” are generated. This situation needs urgently to be changed, so that the amount of waste produced, both domestically and by industry, is reduced and that, as much as possible, generation of persistent and hazardous wastes is eliminated. problem of marine litter and debris will inevitably remain extremely limited. You can download the full report at Greenpeace's web site. Cool waters are those from 4 to 20 oC, from the tropics to the polar regions. The author illustrates the richness of the North Atlantic around Ireland and Scotland, and the Pacific waters of Vancouver, Tasmania and South Africa. As Collins says, "Most new divers are surprised to learn that our cool seas are the ocean's most productive...they create the ocean's richest ecosystem." John Collins is lives in Kinsale on Ireland's south coast with his wife and two daughters where they operate a family-run pharmacy. A passionate photographer from his teens, he started diving at college in Dublin and was immediately was keen to photograph the underwater world. Many of his photos have been successful in competitions and widely published. John Collins is a graduate of the New York Institute of Photography. 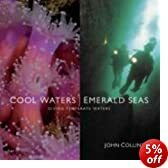 Cool Waters, Emerald Seas: Diving in Temperate Waters is available from amazon.co.uk or signed copies from the author's web site at http://www.johncollinskinsale.com/.